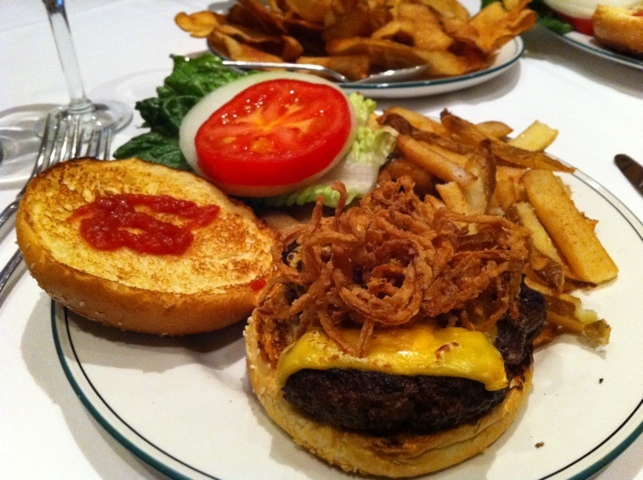 I am a big fan of the Palm restaurant’s Bozzi burger, which I think is one of the most underrated high-profile burgers out there. 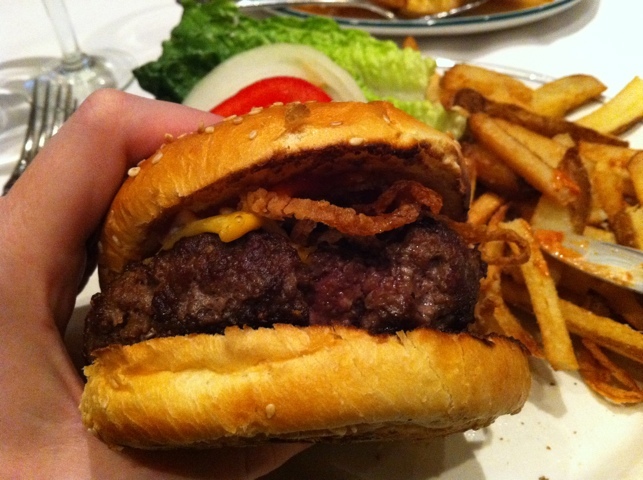 The Palm is a respectable chain (especially here in New York where it was born), and the Bozzi is an interesting take on a burger that gets quite a few things right. The Bozzi is a pretty substantial size, although it seems to me that on the most recent occasion of sampling it it may have been a bit smaller than I recall. Seems to me I used to have a problem simply finishing it, which was not the case this time. Who knows – maybe I was hungrier. As you can see, it is served with onion strings atop it, and the red sauce on the left there is in fact a small drizzle of BBQ sauce (which I didn’t know they added). I usually apply ketchup and mayo to a burger, though some purists may accuse me of cheating since the mayo fattens up the flavor. Either way, it’s what I like. But back to the Bozzi. The first thing that hits you when you bite into it, other than a surprising amount of juiciness, is a strong salt, which I think is pushed forward by the onion strings. However, after the first few chews, you will quickly detect the calcium, close-to-the-bone flavor that I love about a good burger or steak. However, what really makes the Bozzi particularly special is the char. 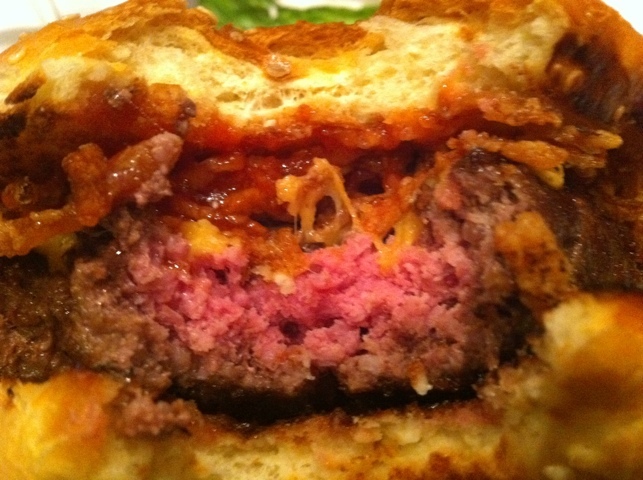 They must cook it at one hell of a heat because as you can see the medium rare comes out just right but has this amazingly wonderful char, which gives the burger a faint crunch and awakens the whole beefy, salty, juicy, delicious experience. It’s a winner. 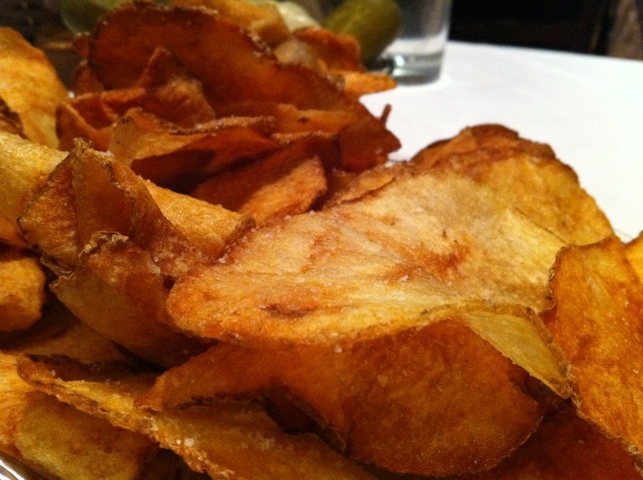 The delicious, home-made chips. Piping hot too. There are a couple of other reasons I enjoy the Palm. If there is a better purveyor of home-made cottage fries than the Palm in New York City, I don’t know. 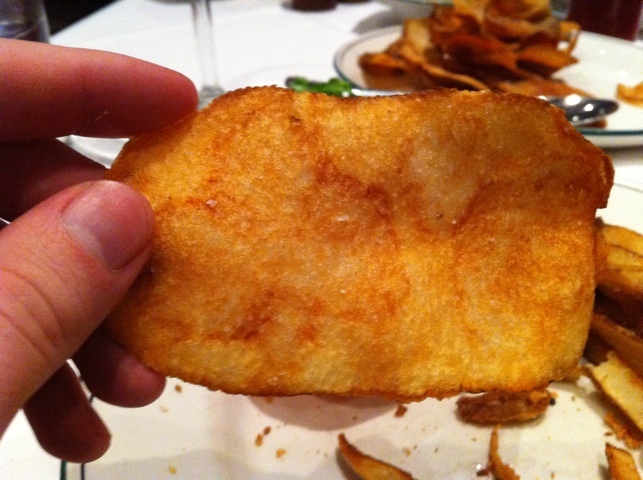 They come out crispy, hot and delicious, well salted and pretty much ideal. I could eat them all day and they pose a serious risk of ruining you for other chips, which will all seem inferior after trying these (at least those that come out of a bag). I always look forward to an order of them when I’m there. Just look at it... fresh, hot, delicious. I mean that is pretty close to an ideal chip. I’m about to watch a football game and all I want is a bucket of these right next to me. A marti doesn't hurt, either. 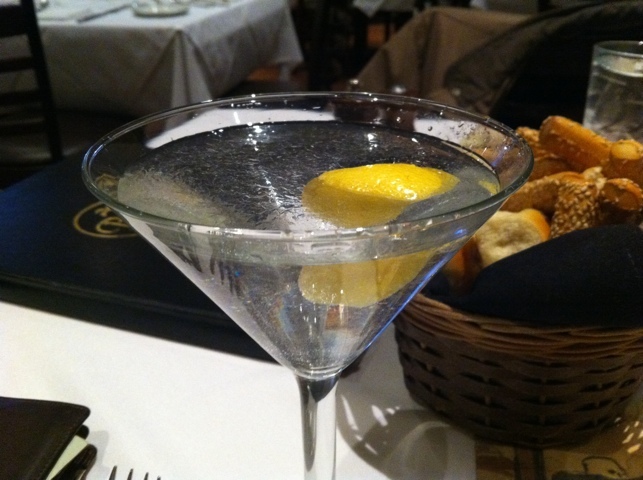 They also have a talented bartender who makes a delicious martini. Notice the skating on top. Delicious. All in all, I definitely recommend the Bozzi at the Palm. I think there are places in town that serve better steak (though the Palm’s is respectable), and these days I’m enjoying Mel’s as far as burgers go more than anywhere else, but you’d do well to try the Palm’s fare and get a delicious Bozzi et al.